Most commonly associated with car accidents, whiplash and whiplash associated disorders are a range of neck injuries caused by a sudden movement or buckling to the neck. However whiplash can be brought on in other ways such as from a fall or from sports such as trampolining. 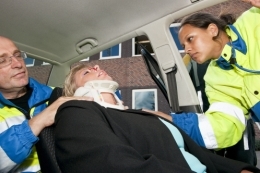 In severe cases, whiplash can induce dislocation or even fractures. Nonetheless by far the most common whiplash injury we at Touch2Heal treat in our Ashford, Chatham and Dover clinics, is whiplash neck sprains. In a car collision your body is constrained by a seat belt but your head, which is quite a heavy object, carries a lot of momentum and is thrown forward and backwards (recoil) quite violently. This can be the case even in a slow collision. The action is akin to snapping a whip hence the term. Whiplash can occur from side on impacts too. A sprain is simply the result of the neck muscles, tendons and ligaments being stretched beyond their normal range. Typically the most affected areas are the sternocleidomastoid, longus coli and levator scapulae muscles. Severe pain and stiffness is usually found in the neck and upper shoulder area. It is quite common for this to come on sometime after the event; maybe several hours later or often the next day as the area stiffens and inflammation builds up and bruising comes out. As a result you are likely to experience considerable difficulty and pain in turning or bending the neck, shoulders or arms. It is also not uncommon to experience lower back pain and possibly suffer nerve pain too. In most cases symptoms start to ease after a few days especially following treatment and in the majority of cases we find the symptoms are gone within a month. In more severe cases however pain can last for 6 months or longer. Our osteopaths use a range of techniques to gently manipulate and stretch the affected joints and muscles to restore flexibility and promote mobility. Treatment will also include massage which helps eliminate muscle tension and spasm and promotes blood flow into the area We will also work to improve your posture which has the effect of reducing strain on your neck. If you are suffering a whiplash then please call Touch2Heal for help. I tried to put up with my whiplash injury but after five days I felt no better and the pain was really wearing me down. I went to see Cecil Kiener at The Mason Clinic in Chatham. Amazingly the next day I felt 50% better! I saw Cecile a total of four times over three weeks and since then I’ve had no more discomfort.